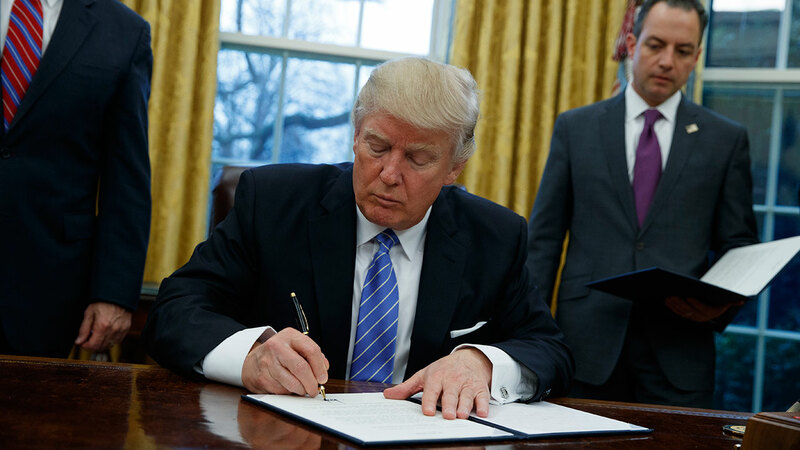 WASHINGTON -- President Donald Trump moved to pull the United States out of the proposed Trans-Pacific Partnership trade pact Monday, fulfilling a campaign promise as he began his first full week in office. "Great thing for the American worker that we just did," Trump said as he signed a notice in the Oval Office. The president also signed memorandums freezing most federal government hiring, though he noted an exception for the military, and reinstating a ban on providing federal money to international groups that perform abortions or provide information on the option. The regulation, known as the "Mexico City Policy," has been a political volleyball, instituted by Republican administrations and rescinded by Democratic ones since 1984. Following a tumultuous first weekend in office - consumed by Trump's criticism of the media's inauguration coverage followed by pushback against his comments - the president was seeking to refocus on the sweeping, yet often vague, promises he made as a candidate. He campaigned as a fierce opponent of multilateral trade agreements, particularly the 12-nation Pacific Rim deal agreed to by President Barack Obama. Earlier Monday, Trump huddled with business leaders and warned that he would impose a "substantial border tax" on companies that move their manufacturing out of the United States. He also promised tax advantages to companies that produce products domestically. "All you have to do is stay," he said during a meeting in the White House's Roosevelt Room. Trump ran for office pledging to overhaul U.S. trade policy, arguing that massive free-trade agreements have disadvantaged American workers. Since winning the White House, he's aggressively called out companies that have moved factories overseas, vowing to slap taxes on products they then try to sell in the U.S.
"Some people say that's not free trade, but we don't have free trade now," Trump said Monday. The president also reiterated his campaign pledge to lower taxes for companies, as well as the middle class, "anywhere from 15 to 25 percent." He also called for cutting 75 percent of federal regulations - and insisted that doing so would not compromise worker safety. Monday's developments came after a first weekend in the White House that included lambasting news organizations for correctly reporting on the size of the crowds at his inauguration and mass protests against his presidency on the following day. Trump delivered a more unifying message Sunday and sought to reassure Americans he was up to the daunting task ahead. Speaking in the White House East Room during a swearing-in ceremony for top aides, the president warned his staff of the challenges. "But with the faith in each other and the faith in God, we will get the job done," he said. "We will prove worthy of this moment in history. And I think it may very well be a great moment in history." Trump said his staff was in the White House not to "help ourselves" but to "devote ourselves to the national good." "This is not about party, this is not about ideology. This is about country, our country. It's about serving the American people," he said. Earlier Sunday, Trump offered a scattershot response to the sweeping post-inauguration protests, first sarcastically denigrating the public opposition and then defending the right to demonstrate a short time later. "Watched protests yesterday but was under the impression that we just had an election! Why didn't these people vote? Celebs hurt cause badly," Trump tweeted. Ninety-five minutes later, he struck a more conciliatory tone. "Peaceful protests are a hallmark of our democracy. Even if I don't always agree, I recognize the rights of people to express their views," the president tweeted, still using his personal account. Trump also spoke with Israeli Prime Minister Benjamin Netanyahu, who accepted an invitation to visit the White House in early February. The prime minister said he is hoping to forge a "common vision" with the newly inaugurated U.S. president that could include expanded Israeli settlement construction and a tougher policy toward Iran. Trump also announced that he's set up meetings with Canadian Prime Minister Justin Trudeau and Mexican President Enrique Pena Nieto. "We're going to start some negotiations having to do with NAFTA," he said of his meeting with Pena Nieto. Mexico is part of the free trade agreement with the U.S. and Canada. Trump said he also will discuss immigration and security at the border. He has promised to build a wall along the length of the southern U.S. border and insisted that Mexico will pay for it. Later in the week, he'll address congressional Republicans at their retreat in Philadelphia and meet with British Prime Minister Theresa May.